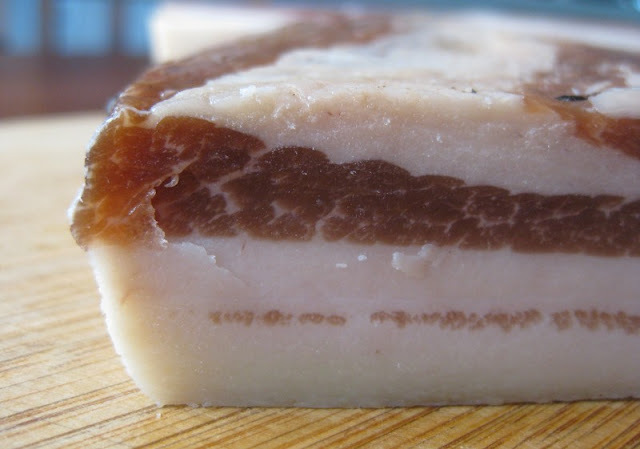 What if I told you that you could make your own pancetta with almost no effort, and without needing any special equipment or environmental conditions? Well, you can! We've written about homemade pancetta before - in fact, it was one of our first blog posts and our first step into the world of making our own charcuterie. We've made pancetta numerous times since then, and it has been great every single time. This latest version is a bit different though. Previously, we have always made rolled pancetta ("pancetta arrotolata"). This time, we decided to be lazy and just do it flat ("pancetta tesa"). Also, while we normally age our meats in our meat/beer/cheese fridge, we realize that not everybody has one of these at their disposal, so we decided to try doing the whole process in our regular refrigerator. Whether you are making tesa or arrotolata, the first step is the same. 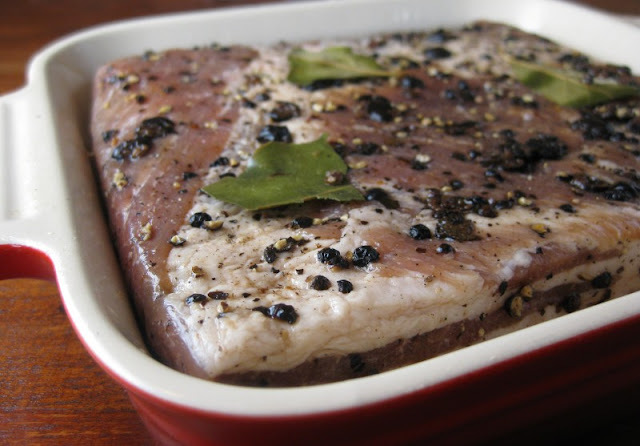 Fresh pork belly gets cured for about a week in a dry rub of salt, brown sugar, garlic, peppercorns, juniper berries, bay leaves and pink salt. The above picture is what it looks like after this first week of curing. For tesa, the next part is easy: rinse it, dry it, and then put it on a rack to air dry for about a week - all right in your refrigerator. We were concerned that the cold, refrigerated air might be too dry and harsh. So, to help prevent the exposed meat from hardening into a little brick, we kept it fat-side-up and elevated only about an inch above a shallow tray. This both protects the tesa and slows the drying time. It worked well and our belly was shiny and reasonably dense after hanging out for eight days. Finally, we put into a plastic bag for a few more days to allow moisture to redistribute and rehydrate any slightly over-dried edges. 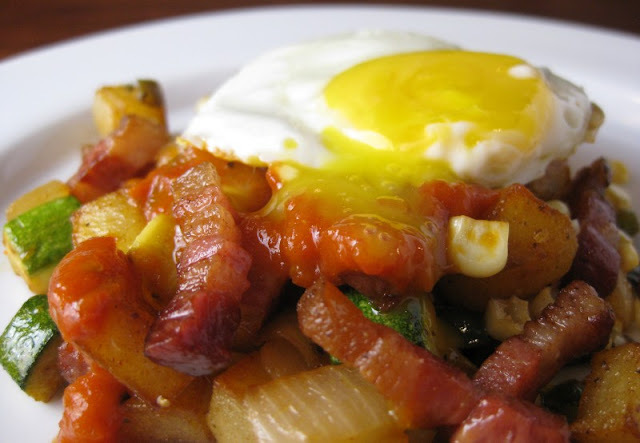 Vegetable hash. Pancetta tesa lardons. Tomato jam. Fried egg. How did it compare to previous batches of pancetta we've made? Very favorably, indeed. Maybe not quite as photogenic as the rolled version, but it tasted every bit as good. So, for those of you who have been procrastinating about taking a stab at curing yourself some meat, you really have no excuse not to do it now. Trim the belly so that its edges are neat and square. Combine the ingredients for the cure in a bowl, and mix thoroughly. Place the belly in a nonreactive container just large enough to hold it (or use a sealable plastic bag). Sprinkle the mixture all over the belly, turning it as needed to give it a uniform coating. Cover and refrigerate for about a week. Flip it over every day and gently redistribute the seasonings with your fingers. After 7 days, check the belly for uniform firmness. If it still feels squishy, return it to the fridge for another 2 or 3 days. Once cured, remove the belly from the container, rinse it under cold water, and pat it dry. Lightly oil a metal rack and place it on a shallow tray. Place the belly on the rack, fat side up, and refrigerate uncovered for up to two weeks. 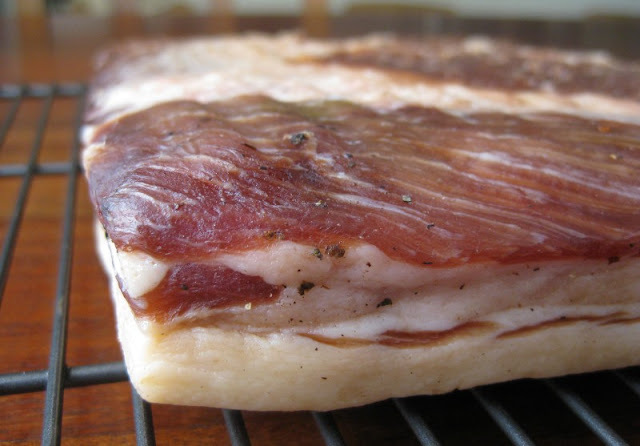 When the pancetta is nicely solid, but not too hard or dry (usually 6 to 9 days) place it in a plastic bag and return to the refrigerator for another 3 or 4 days. This will help rehydrate any hard edges or corners. When ready to use, cut into lardons or cubes, saute gently and add to your favorite salad or pasta. Portion the remainder into 2 to 6 ounce pieces and freeze for future use. Looks great! Hey, I wanted to let you know that I've been inspired by your site to make my own bacon (and other things). Bought a smoker and some pork bellies yesterday. I'll let you know how it turns out. Hi Steve - thanks, and good luck with the bacon! Once you've made your own, you'll never go back to store-bought. +1. I haven't purchased bacon since I first made my own bacon. Store-bought bacon = water, salt and fat. Homemade bacon = smoke, MEAT, fat, salt and spices. HUGE difference. Make your own bacon today! The same holds for pancetta. Homemade is infinitely better than what passes for pancetta in the supermarket. Hey Mike! I have a confession. Charcuterie scares me, which is why I haven't taken the plunge. Everytime I think I'll try making something, I read about food poisoning etc. But I think this recipe for pancetta tesa might be the one I try first. I was going to try to make some bacon but then this heat wave came through so that will be put on hold until it's cooler. BTW, how long will the pancetta keep in the fridge? Hi Carol - you can treat pancetta much like you would bacon. It should be fine for several weeks in the fridge. After we make a batch, though, we parcel it up into more manageable portions, food-saver them and freeze them. So I cured my bacon over the past week and smoked it yesterday with awesome results! I used a maple syrup (pure) and salt cure with no nitrates. It came out of the smoker looking good but not as pink as yours, likely due to not using pink salt. I smoked it over mesquite wood, which is not recommend but that's what came with the smoker I bought and I was too exhausted from camping with my son to go buy some other wood. But the taste and flavor was tremendous! It was a little to "woody" for me likely from the mesquite but my wife was fine with it. I think I've still got lots of room to improve though my first try was orders of magnitude better than store bought. Funny but this bacon reminds me of the bacon I ate as a kid growing up in Philly. Likely that bacon was made in small batches and not industrialized. Sorry for the long post and thanks again for the inspiration. Congrats on your first bacon, Steve! The nice pink color is definitely a result of the pink salt. While there seems to be somewhat of a backlash against using it these days, I have found no real basis for it. I think the backlash against pink salt is due to the nitrates, which are a preservative. Nitrates will turn to nitrosamines during smoking and are thought to cause cancer, though I'm not sure how much of that is hype versus real. I like to keep the nitrates out because my son reacts poorly to them. Steve - yes, it is the nitrates/nitrites that are at issue. Besides producing that nice, pink color, they also are a protection against botulism, which is a concern because the smoker is an anaerobic environment. Would pink salt be cure#1 or 2? Prof_Swiss - Pink salt is cure #1. Good question!